The Industrial Revolution was the transition to new manufacturing processes in the period from about 1760 to sometime between 1820 and 1840. It was a time when many of the modern inventions we take for granted today were created. 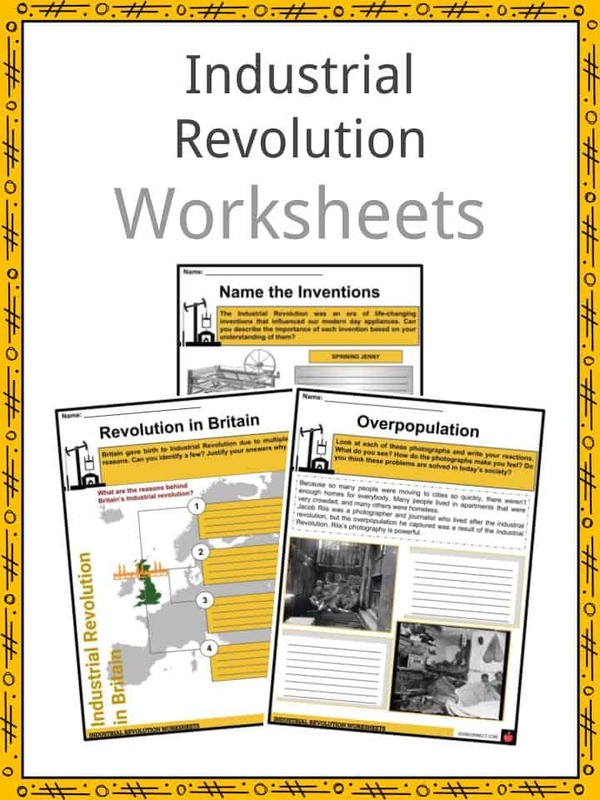 See the fact file below for more information on the Industrial Revolution or alternatively, you can download our 20-page Industrial Revolution worksheet pack to utilise within the classroom or home environment. Before the Industrial Revolution took place in Britain, most people resided in rural areas and worked as farmers. Commoners often experienced malnourishment and diseases. Local rural shops and homes usually made simple tools and furniture. By the mid-18th century, a number of European states including Britain, Spain, and France were under competition as rising colonial powers. Britain had engaged in tremendous wars such as the Austrian war of succession (1740-1783), Seven Years’ War (1756-1763), American Revolutionary War (1775-1783), and the Napoleonic Wars (1803-1815). Due to massive pressure to produce the supply of goods needed for the war, Britain underwent industrial changes. With the ideas of intellectuals like Isaac Newton, Galileo Galilei, and Nicolaus Copernicus, Europe became the seat of Scientific Revolution. European societies became more open to new and innovative ideas. Beginning in the 17th century until the mid-19th century, methods in agriculture evolved in Belgium and Holland. Techniques such as crop rotation, enclosed fields, selective breeding, and manuring increased food production and promoted the idea of capitalism. Moreover, it led to rapid population growth. By the 18th century, an inflow of immigrants led to the development of small industries. On the other hand, India as a British colony influenced the huge production and trade of cotton. As a result, Britain became known as a woollen industry, despite its inability to grow their own cotton due to cold climate. This established trading relations with India and southern United States. 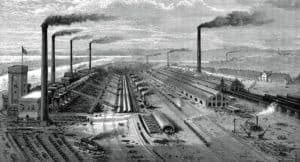 Due to vast coal and iron reserves, Britain took advantage of these minerals to build industries such as shipbuilding, railroads, and construction. Since the 18th century, Britain already had financial institutions like a central bank, countybanks, and the stock exchange which set the stage for entrepreneurship and capitalism. The central bank of the United Kingdom, now known as the Bank of England was established in 1694 to secure Britain’s financial money and business flow. With the rising economy of Britain, it put pressure on improving their transport system. 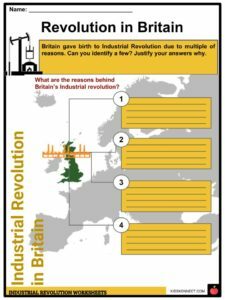 The Industrial Revolution occurred in the last part of the 18th century in Great Britain. This revolution was an economic one, and it changed the way the world produced goods. The population went from being agricultural to industrial. This meant people moved off of the farms and out of the country. There were huge numbers of people that moved into cities. Many people were forced to move to the cities to look for work. They ended up living in cities that could not support them. During this time, there were also many new advancements in technology. The assembly line was one of the biggest inventions. 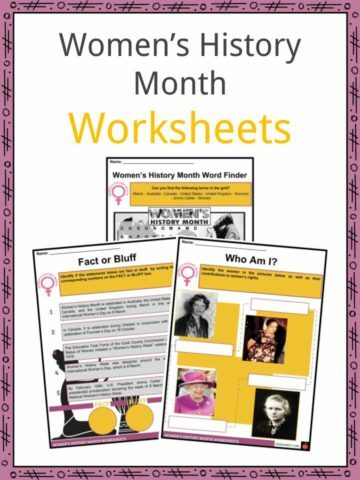 Henry Ford is credited with this invention. 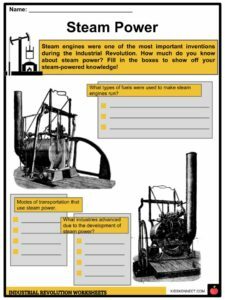 Some of the biggest advancements were in steam power. New fuels such as coal and petroleum, were used in these new steam engines. 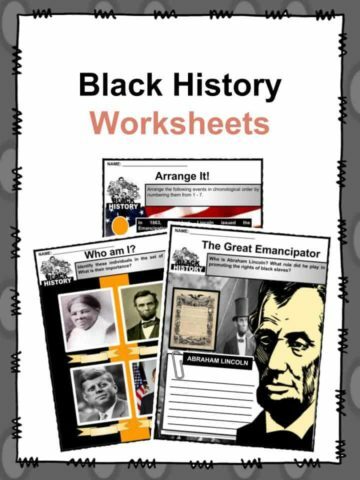 This revolutionized many industries, including textiles and manufacturing. Another invention was called the telegraph. 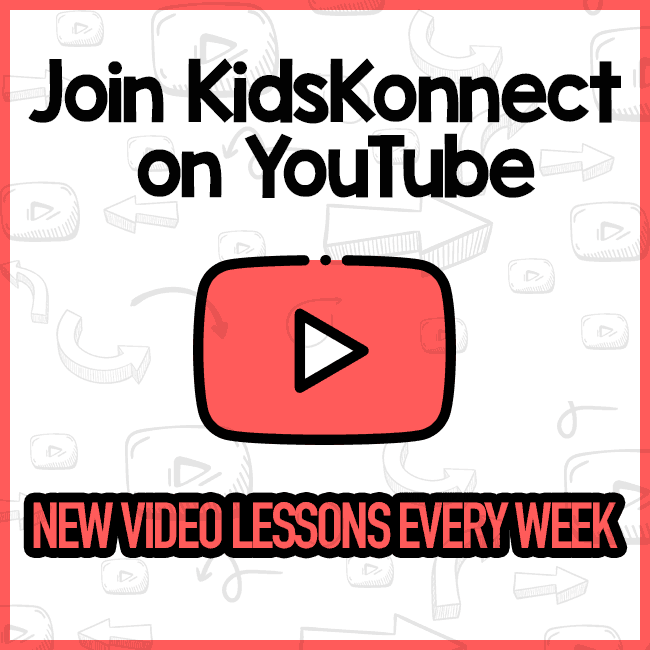 This made communicating across the ocean easier and much faster. Messages could be sent and received in minutes and delivered the same day. Writing a letter and sending it overseas could take weeks. In 1764, Englishman James Hargreaves invented the spinning jenny (abbreviation of the word engine) which enabled production of multiple spools of thread continuously. 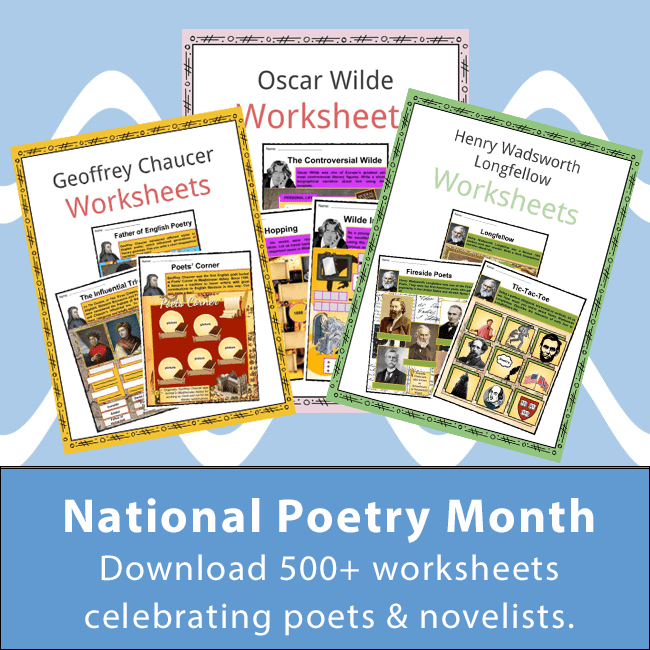 In addition, English inventor Edmund Cartwright invented the power loom in the 1780s which mechanized weaving of cloth. In the iron industry, Englishman Abraham Darby discovered an easier method to cast iron. By the 1850s, British engineer Henry Bessemer initiated a cheaper way to mass produce steel. Both iron and steel became a vital ingredient in building ships, infrastructure, and appliances. Thomas Newcomen was the one who developed the first practical steam engine which was originally used to pump out water from mines. It was in the 1770s when James Watt, a Scottish inventor who improved on Newcomen’s work and used steam engines to power machines, locomotives, and ships. Despite the effort of the British government to contain export of technologies and skilled workers within their country, they failed as industrialization moved out of Britain and spread to other European countries and the United States. The Industrial Revolution was not a good revolution for the earth. Industry was releasing huge amounts of carbon dioxide into the atmosphere and waste into the waterways and soil. Pollution by nuclear waste, pesticides, and other chemicals were also the result of the Industrial Revolution. Many natural resources were being used up at an alarming rate. Advances in farming resulted in an increased supply of food and raw materials. The changes in industry and new technology resulted in increased production of thousands of goods. Companies were more efficient and earned bigger profits. Due to unstoppable industrialization, urban areas were unable to keep up with the influx of migrant workers. Industrialized areas became overpopulated. 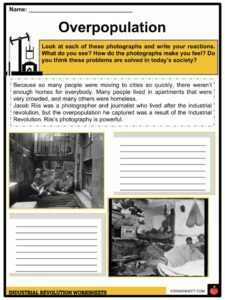 People were living in overcrowded housing and were prone to unsanitary conditions which led to diseases. It was only in the late 19th century when the British government introduced labor reforms which enhanced working conditions. 1712 – Thomas Newcomen invented the steam engine known as the Newcomen Engine. The machine was only used to pump water out of mines and wasn’t very useful yet. 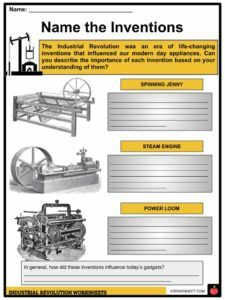 But the use of steam to power machines became a vital turn-point in the Industrial Revolution. 1719 – John Lombe started his own silk factory, the first silk throwing mill in England and the first factory ever built. 1733 – John Kay invented and patented the Flying Shuttle, a simple weaving machine which allowed one weaver to weave wider fabrics cutting labor force by half. 1764 – James Hargreaves invented the Spinning Jenny [Jenny being a variant of the word Engine], a machine which made cloth-making faster and easier as one worker could spin eight spindles altogether. 1767 – Richard Arkwright invented and patented the water-powered spinning frame known as the Water Frame which made cotton thread creation easier. 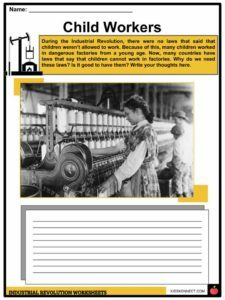 The machine was first used in 1768 and manufactured yarns that were sturdier and harder than what the spinning jenny produced. Arkwright’s invention played an important role in the development of the factory system. 1769 – James Watt improved the Newcomen Engine and built a more efficient steam engine, considered one of the most vital inventions of the Industrial Revolution. 1775-1779 – Between these years, Samuel Crompton invented the spinning mule, a machine that combined the spinning and weaving processes. It was so named as the mule is the crossbred offspring of a female horse and a male donkey much like the machine which combined the works of the spinning jenny and the water frame. Later on, in 1825, the self-acting or automatic mule was patented by Richard Roberts. 1776 – Adam Smith’s Wealth of Nations [whole title read as “An Inquiry into the Nature and Causes of the Wealth of Nations”] was published. Smith’s work is considered fundamental in Classic Economics. 1783 – Henry Cort patented the puddling process used for refining iron ore. It was also around this time that the ironmaster started to refine pig iron to wrought/bar iron using his own-devised production systems. 1785 – Edmund Cartwright’s invention, the power loom [a weaving machine], replaced the flying shuttle. 1794 – Eli Whitney patented the cotton gin, a machine that made the separation of cotton seeds from the fiber easier allowing America’s southern states to make more money from their cotton crops. 1801 – December 24 of this year, Richard Trevithick introduced his Puffing Devil to the world, so-named because it puffed steam in the air]. The Puffer was the first steam-powered passenger vehicle ever made cementing Trevithick’s importance in the Industrial Revolution. Unfortunately, the Puffer was destroyed a few days later when it overheated and combusted. 1804 – Trevithick built the first steam locomotive to run along a track. Eventually, the inventor died penniless as his inventions didn’t last after a few measly trips but his legacy in the Industrial Revolution did live on. 1807 – Robert Fulton commercially developed the first passenger steamboat which went into business in that year. In 1800, Napoleon Bonaparte commissioned him to design history’s first practical submarine, the Nautilus. 1811- 1813 – The beginning and end of the Luddite Rebellion. 1816 – George Stephenson patented a steam engine locomotive that ran on rails. While he wasn’t the first one to do so, the improvements he made on steam-powered locomotives and the railways they ran on were greatly significant that he was named the “Father of Railways”. He went on to build the first-ever public inter-city railway line in the world which was the Liverpool and Manchester Railway. It opened in 1830. 1845 – German philosopher Friedrich Engels published his book The Condition of the Working-Class in England which tackled the negative effects of industrialization. 1846 – On September 10 of this year, Elias Howe was awarded the first US patent for a sewing machine using the lockstitch design. He wasn’t the first to invent the sewing machine but he developed it and his developments made him a sewing machine pioneer. 1847 – Samuel Morse received the patent for the telegraph which allowed messages to be sent via wires. When 1860 rolled in, telegraph wires went as far as the United States’ East Coast. He also was the co-developer of the Morse Code. 1851 – Elisha Graves Otis, with his sons, designed and developed a safety break for elevators. He wasn’t the inventor of the elevator but he made riding it safer. He exhibited the safety break in the 1854 New York World’s Fair. it subsequently gained traction and this time that he made a company out of it, the Otis Elevator Company. 1855 – January of this year, Henry Bessemer created a process which turned iron into steel. This process was later on called the Bessemer Method in his honor. 1856 – Isaac Singer made his own improvements on existing sewing machine designs of his time and obtained great success from it. However, his design was greatly contested by Elias Howe who held the patent for the lockstitch. Eventually, Singer and the other sewing machine inventors agreed to pool their patents [they were the first ones to do so] and convince Howe to cooperate. He did so on terms that he be given royalty for every sewing machine sold. 1866 – Alfred Nobel invented the dynamite which was safer to use in blasting holes compared to just using black powder. 1870 – Chemist Louis Pasteur developed vaccines to weaken the effects of diseases like anthrax. This was in connection to his belief that illnesses were mainly caused by germs. His pioneering works helped developed the medical world. He was also the first one to encourage and practice sanitation and sterilization before doing surgical procedures. 1876 – Alexander Graham Bell secured the patent for the telephone, a breakthrough in communication. 1880 – Thomas Edison was granted the patent on the carbon filament electric lamp, the first commercially practical incandescent light. Edison is also credited for inventing the phonograph. 1883 – May of this year, what was then the world’s longest suspension bridge, the Brooklyn Bridge, opened for public use. 1888 – Nikola tesla got the credit for developing the induction electric motor, a significant contribution to the modern electric supply system. 1902 – German inventor Rudolf Diesel invented the Diesel engine which was named in his honor though it went through many hands for its development. 1903 – Orville and Wilbur Wright built and flew the first airplane successfully and credited as aviation pioneers. 1908 – Car maker Henry Ford manufactured the Model T, a car that was cheaper than the others as it was made on an assembly line. The Model T made cars more available to common people. 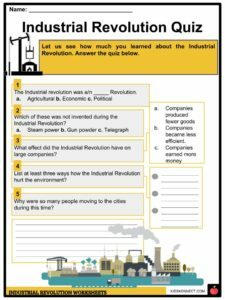 This is a fantastic bundle which includes everything you need to know about Industrial Revolution across 20 in-depth pages. 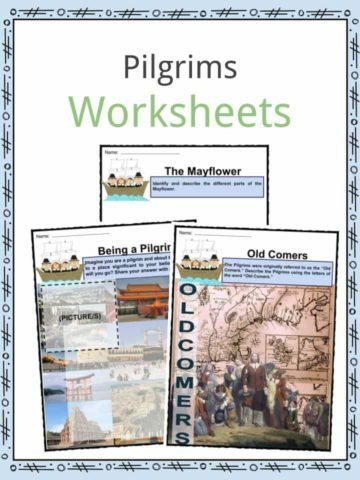 These are ready-to-use Industrial Revolution worksheets that are perfect for teaching students about the Industrial Revolution which was the transition to new manufacturing processes in the period from about 1760 to sometime between 1820 and 1840. It was a time when many of the modern inventions we take for granted today were created.